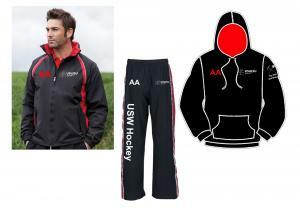 Combo deal for USW Hockey including a Waterproof Jacket, Standard Contrast Hoody and Tracksuit Bottoms for just £71. If you do not want all items in the same size or would like ladies fit tracksuit bottoms please email us with the relevant sizing once you have placed your order. Please see individual product pages for full design and sizing details.